Apparently, Tuesday's Fallout 3 plasma rifle was just the start of the amazing videogame weapon props, and this time it's Mass Effect 2 that's getting the model treatment. 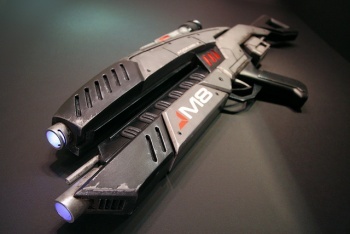 Graphic designer and self-confessed geek Harrison Krix has crafted a replica of Mass Effect 2's M8 Avenger Assault Rifle that is hard to call anything other than perfect. Krix might be familiar to regular readers of The Escapist's news, as he's the same guy who made the Portal gun, and the incredibly impressive Big Daddy suit last year. The rifle is constructed mainly out of MDF, with small plastic or metal pieces added where needed. There's a little bit of electronics in there as well, to add lights to the parts that are supposed to be illuminated. While building it, Krix set himself a challenge to only use scrap he had lying around, which he was largely able to do, meaning that the cost of the raw materials ran to just $28. You can read a very detailed guide to the rifle's creation on Knox's blog, as well as marvel at some of his other projects. It's hard not to be impressed by this model; even if you don't especially like the Mass Effect games, the amount of skill that went into making this is simply amazing. It's incredibly exciting - to me, at least - to see the world's videogames brought to life like this, especially when the end result looks so good.